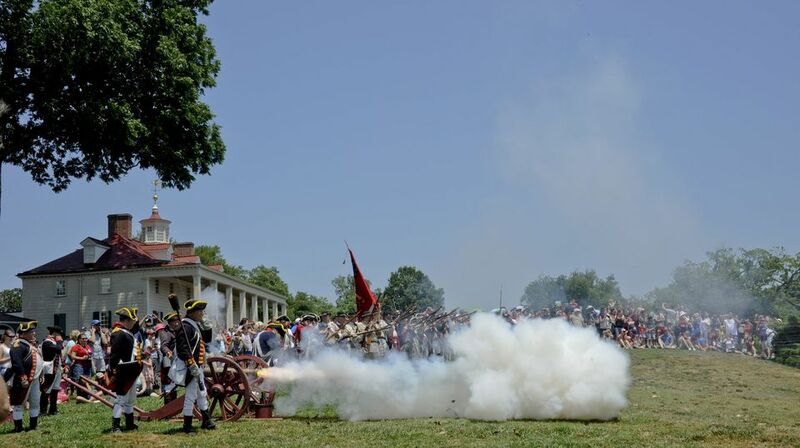 George Washington’s Mount Vernon Estate and Gardens celebrates Independence Day with special programming. The Estate will host evening fireworks on Sunday June 29 and Monday June 30, 2018. Daytime fireworks will also be displayed during the annual Independence Day event on July 4th. Visitors will be treated to spectacular smoke fireworks in patriotic colors fired during the finale of the National Concert Band of America's performance. The event also includes an inspirational naturalization ceremony for 100 new citizens, military reenactments, a special wreathlaying ceremony, free birthday cake for all (while supplies last), and a visit from "General and Mrs. Washington." Mount Vernon was the home of our first commander-in-chief, who led American troops to victory in the country's fight for independence. The annual Red, White & Blue Independence Day celebration is an unforgettable place to celebrate George Washington's contribution to America's freedom on July 4th. All events are included in regular Estate admission. All day, "General and Mrs. Washington" will be on hand to greet and take photographs with visitors. In the Donald W. Reynolds Education Center, visitors can cool down in the Revolutionary War Theater where snow falls on the audience as Washington is crossing the Delaware River. 6-9:45 p.m. — Fireworks and Ice Cream Making, Admission: $35 per adult, $25 per child. Admission includes a tour of the Mansion and grounds. Restaurant concessions will be open. 9:30 a.m. — Re-enactors from the First Virginia Regiment assemble for inspection by "General Washington" on the Bowling Green, where the Declaration of Independence will be read by the First Virginia Regiment. 10:00 a.m. — Visitors may join the George Washington Chapter of the Sons of the American Revolution (SAR) in a procession to George Washington's Tomb for a special wreathlaying ceremony. 11:00 a.m. — A special Independence Day naturalization ceremony for America's 100 newest citizens with the United States Citizenship and Immigration Services. 12:00 p.m. — The annual "Red, White and Blue Concert" takes place featuring patriotic favorites by the National Concert Band of America, an 80-member company of retired musicians from each of the United States Armed Services' bands. 12:45 p.m.–12:50 p.m. — A pyrotechnic salute to America from the home of George Washington! Watch as a colorful display of smoke fireworks are fired over the Potomac river. 1:00 p.m. — Mount Vernon's all-American birthday cake will be offered to visitors (while supplies last). 1:30 p.m. — Fife and drum corps will perform military music and drills. 2:30 p.m. — Revolutionary War military demonstrations by the First Virginia Regiment take place on the Bowling Green. July marks the beginning of the wheat harvest season. Field hands will kick-off the season on Independence Day with wheat-treading demonstrations at the George Washington: Pioneer Farmer site. Costumed staff will lead Mount Vernon's horses as they tread wheat in the 16-sided barn at 10:30 a.m., 11 a.m., 1 p.m., and 3 p.m.
2018 Gay Pride Parade in Washington, D.C.